The Blenheim Online Store Is Now Open! Blenheim Bottlers is happy to announce our online store is ready and waiting to begin shipping Good Ole Blenheim Ginger Ale. The Old Fashioned Ginger Ale that started in the 20th Century now moves into the 21st Century. Back in 1903 when Blenheim Ginger began being bottled, no one could have imagined a time when it would be available to every home in America. Well, it only took us 100 years to be able to do it, but we are ready to roll. Now you can enjoy spicy hot Blenheim Ginger Ale in your home anywhere you live. No more searching far and wide for the rare bottles of Blenheim Ginger Ale you crave, because now we can deliver it right to your doorstep. Whether it’s the ginger smashed Old #3 Hot, the powerful #5 Regular or our dynamite Diet #9, you can now have your fridge stocked full all the time. 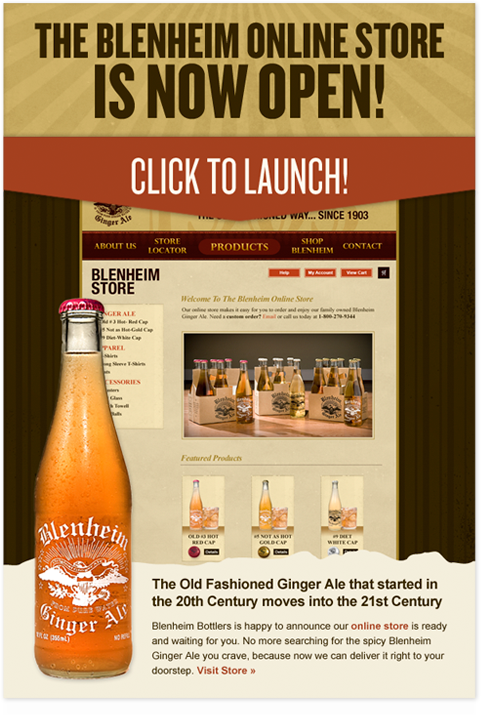 Now you can have Oldtimey Blenheim Ginger Ale delivered in a completely New School way by placing your order with our online store. We are ready to begin taking orders immediately and start shipping them by the case right to payday loans direct your home. The price for each case of 4 6-packs of 12oz. glass bottles is only $24, and shipping varies by location. So that’s only $1 per bottle for the sweet, hot, fireball flavor of a bottle of Blenheim Ginger Ale. No more paying high prices from other websites or resellers. You can now get Blenheim direct and fresh from the factory to your fridge. The milkman used to deliver to your door, now Blenheim Ginger Ale has taken over that job! Follow Blenheim Ginger Ale on Twitter, @goodoleblenheim, and connect with the official Facebook page for updates, info and news about Good Ole Blenheim Ginger Ale. This entry was posted on Friday, October 1st, 2010 at 12:32 am	and is filed under General, News & Press. You can follow any responses to this entry through the RSS 2.0 feed. You can leave a response, or trackback from your own site. There is nothing else like it – no substitute — for mixing, for cooking, for drinking. The heat, the quality – the great spicy-hot surprise of Blenheim makes every other ginger ale a pale idea of ginger.